An updated map of the locations worldwide who have visited the Vintage Sixties Live Website since 9 December 2007. Click on image to enlarge. I got an interesting email from Bob Byrne the other day about this shifty looking lot. They are collectively known as Frankies Café, a band that has been operational within the North East since 1999, and over the years have become known for performing the odd charity gig to raise money for worthwhile causes. As you can see from the pic, the band is a seven piece, four of which are over 60 (shock horror!!). The rest of the mob are fairly close behind in age, and probably far too close for their own liking. Individually, their pedigree is impeccable. Billy, the singer, played with our own Colin the Orchestra's Woodland's old group, the Del 5, back in the sixties, and toured with The Walker Brothers, Tom Jones etc. The drummer played with Burlesque professionally for many years, and Bob played with the Bits'N'Pieces in the early to mid sixties. In between these times, they have, along with the others in the band, played with Uncle Tom Cobbly etc.etc.etc.etc. and many other passing ships (oops.. musicians) in the night. 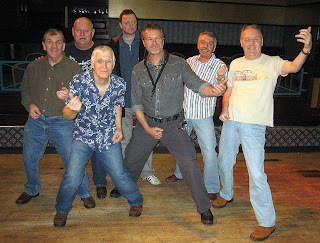 The lads' next big Charity Gig is for the Macmillan Trust at the Clavering Club, Dunston on 7 February 2008. Tickets are £5 from the club or the band. It may be possible to turn up on the night and gain entry, but this will be dependent on whether any tickets are left (I am informed that tickets are selling quite well!). The band will be playing totally for free, so that all monies raised can go to the charity. Over the past couple of months, one of the lads in the band has even managed to cajole local pub landlords into donating the odd bottle or two, and these will be raffled off on the night. Other kind souls have also donated items for the raffle, obviously appreciative of what the charity does and stands for. One poor demented soul has pledged £75 to sit in and play drums with the band for a few numbers. Bob jokes that he is obviously a sad case, but yes, they'll take his money. 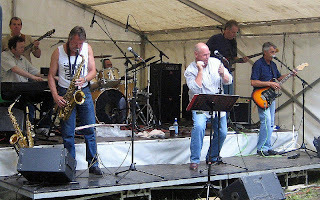 The gig came about because one of the bands long serving `fans' developed bone cancer some time ago and died late 2007. At the end, Macmillan Nurses were involved, and they are doing this as a way of putting just a little something back into system. It really sounds like a great night and I hope as many of you as possible will support it. If you cannot make it on the night why not go and see the band at one of the following gigs and just give them a donation or a raffle prize. All gigs are free admission; kickoff about 9pm. We have now smashed the 75000 hits barrier on You Tube. Angie is still top of the pops with well over 4000 hits for the Dusty cover "I only want to be with you"
Erik is still in second place with "Tequila" and Paula's "Race with the Devil" has now moved up into third place. Well done to all performers (and viewers). If performers would like any of their clips uploaded just let me know and I'll do what I can. 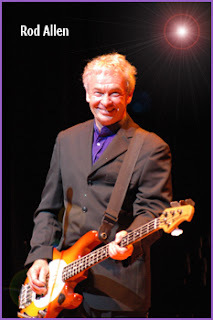 It is with great sadness that I must report the passing of Rod Allen, one of the signature sounds of the Sixties. Rod was at home in Coventry with his family around him. His wish was for The Fortunes to continue, so they will do their utmost to keep his legacy alive and make The Fortunes a group that Rod would be proud of. Thanks for the music Rod. I got quite a shock this morning when I found the following comment on YouTube. It was on our cover of Gun's fantastic track Race with the Devil. It also transpires that Paul's Dad was once Tour Manager for the Shadows. At that time Paul was a hairdresser and he used to cut Jet, Hank and Tony's hair. Paul is now living in the US of A and still very much involved in the music business. His website is undergoing a make over but there are several brilliant examples of his current work here. It is really great that these guys take the time and trouble to make contact with us.